If you’re thinking about training your pup to use the outdoor bathroom, you might want to start with the best dog pee pads first. However, if you don’t have the time to search for these products on your own, we’ve got you covered. After carefully going through numerous online product reviews, Dr. Fox has concluded that a reliable item for your pup’s needs is the All-Absorb Training. 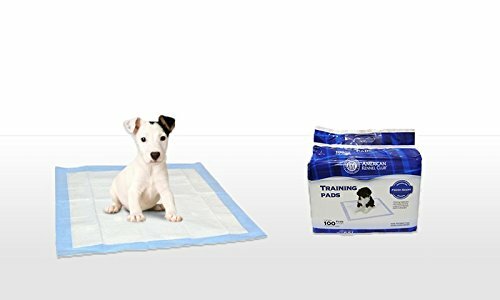 The pads are specifically designed to train or assist large dog breeds, come with a quick-drying surface, and will turn urine into gel almost instantly thanks to the super-absorbent core. If this item is not available for sale right away, perhaps the Four Paws Wee Wee would be a good alternative. Since they are somewhat bigger compared to other choices, these can be used both for puppies and for larger breeds and dogs who are a older and have incontinence. The quick-drying surface makes it possible for your pooch to remain comfortable all throughout the day. Besides, these pads are equipped with an effectively absorbent core that practically turns the liquid into gel almost immediately. They’re not the most affordable alternative in this particular line. These leak-proof and quick-drying pads are worthy of your consideration since they also neutralize odors and leave the room smelling fresh. 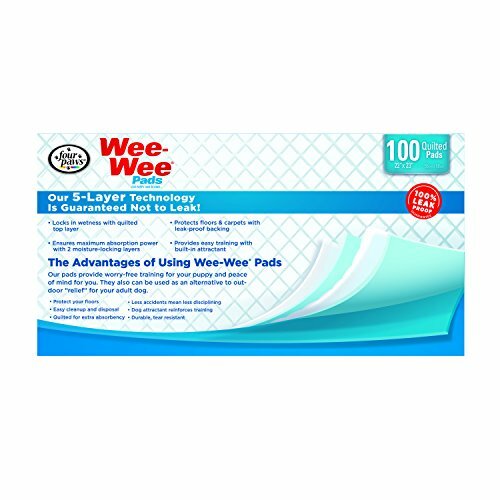 If you’re looking for a deal and you want to make sure that you don’t end up wasting your precious cents on pee pads that aren’t effective, then you should consider these. They’re suitable for all dog breeds since they measure 22 by 23 inches. They have a plastic border that can contain the urine; therefore, they are more or less leak-proof. Every pad is equipped with as many as five absorbent layers. To get the best bang for the buck, you need to buy these in bulk. This product can be a great choice for an aging dog or for a puppy that hasn’t been trained yet to take wee wee trips outdoors. Every pad in this particular set is lined with a plastic border, so there won’t be any overflowing or leaking going on. 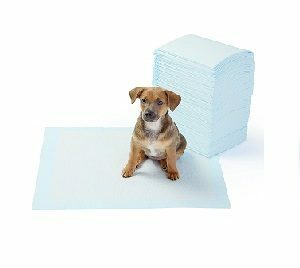 You can place the pads anywhere around your house and they’ll represent a decent bathroom for your pooch for now. The super absorbent core that they have been equipped with is a great addition as it turns the liquid into gel in a matter of just several seconds. They work for seniors and puppies, too. These can become slippery if a large dog uses them. 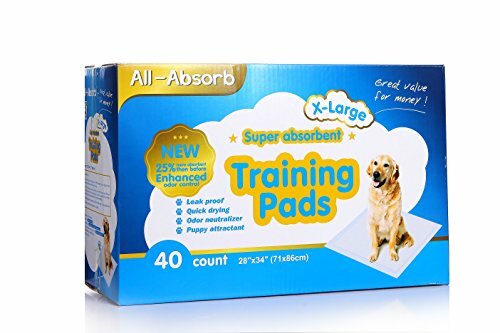 These pads can be an effective solution for assisting aging or sick dogs, but they do the same good job for training puppies, just as well. The market is full of products specifically designed to make your dog’s life easier. And, while we cannot talk about all the dog pee pads available over the counter, we do have some suggestions for you. Showcased below you can find some of the products that were acclaimed by the critics and received top scores by those who purchased them. 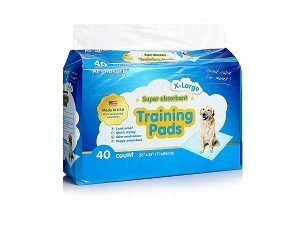 These training pads were designed to meet the needs of training puppies or assisting aging large breed dogs. They come with a quick-drying surface that prevents tracking, allowing your dog to feel comfortable all day long. The pads feature a very absorbent core that can turn the liquid into gel almost instantly. The large surface can hold more than three cups of liquid at once, so you won’t have to change the pad too often. In fact, a regular dog can go through the night with the same pad, allowing both you and your pawed friend to have a good rest. The box comes with 40 pads that are leak-proof and quick drying. The products will also help neutralize odors and have your room smelling fresh, without worrying about specific pet smells. Most of the customers who ordered these pads for their dogs agreed with this statement, claiming they are trustworthy and good for masking unwanted odors. The product is delivered in a box with 100 individual pads. They are perfect for potty training, but they represent a viable solution for an indoor bathroom for all dogs, regardless of their size or age. These pads are suitable for all dog breeds as they measure 22 x 23 inches. They come with a plastic border to contain the urine and keep it inside, preventing unfortunate leaks and discomfort. Each pad features five different layers to provide extreme absorption and protection. Therefore, you can safely place the pads on all types of surfaces, including wooden floors, without the risk of leaking or damage. In other words, you can create a decent restroom for your pup or senior dog in the comfort of your own home, without having to take your pet out every day at least once. However, keep in mind that the pads should not replace your daily walks with your pet. On the contrary, they represent smart and efficient solutions for short periods of time. The item is available in two different sizes – regular or extra large – so pick the right dimension according to your pet’s age, breed, and size. Each pad in size regular measures approximately 22×22 inches, enough for medium-sized and small dog breeds. It also comes with a plastic border on all sides to prevent leaking and overflow. 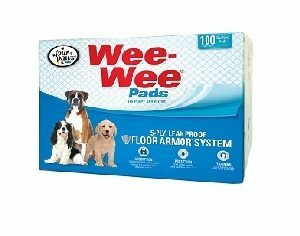 Therefore, these pads can be placed anywhere around the house and will provide a perfect indoor bathroom for your pup. They come with a super absorbent core that will turn the liquid into gel in just a matter of seconds, so your pet will stay dry. These pads are perfect for puppies and senior dogs alike. They are also an excellent solution for assisting sick or aging dogs, making the transportation more accessible and more comfortable whenever your dog doesn’t have access to outdoor venues. The product also comes with smart tips for training your dogs to use the potty successfully in the shortest possible time. What we liked the most about these pads is that you get to choose between various package sizes, pad sizes, and scents. Therefore, you can easily find the perfect match for your pet, regardless of its age, size or breed. The 100 and 150-pack are the most convenient options, but you can also pick the 50-pack if you’re using this product for the first time and want to see how your own pooch adjusts to the pads. They are available in four different subtle scents, including lemon and lavender, to absorb and eliminate odors, releasing a fresh smell instead. Each pad features six different layers and will turn the liquid into gel in just a matter of seconds. Therefore, it will offer immediate absorption to avoid unwanted leaking, tracking or damaging your floors. And, thanks to its superior quality, it will also get rid of bacteria, reducing the risk of infections or skin rashes. These pads come in two sizes, X-Large and Regular, so fitting won’t be a problem, no matter how big your hound is. The packages are also convenient, so you can choose the 30-pad box for whenever you’re going on vacations or the 120-pad version when you are staying at home. The product features a 5-layer construction and a super absorbent core that will turn the liquid into gel on contact. Therefore, your puppy will stay dry, and your floors won’t be damaged. It is enriched with a carbon component that neutralizes odors, leaving the room fresh. The pads are perfect for both indoor and outdoor use and measure 28 by 34 inches each. They are great for training your puppies, assisting senior dogs or as a potty whenever you’re traveling with your pooch. They also come with a quick-dry surface and a leak-proof plastic lining that doesn’t allow the liquid to fall on the ground and damage your floors. Thus, you can place the pads anywhere inside the house, even on hardwood floors. A dog is a man’s best friend but getting there requires plenty of your time and attention. Training your pooch should start as early as possible and the easiest trick to learn is have your dog satisfy his physiological needs outside. However, the first few weeks are critical and, in order to avoid any accidents, you might want to start purchasing some good dog pee pads. And if you’re having trouble finding the best ones for your pet’s needs, here are some features you might want to take into account. First of all, consider the size of the pads. It should be according to your dog’s size, breed, and age. 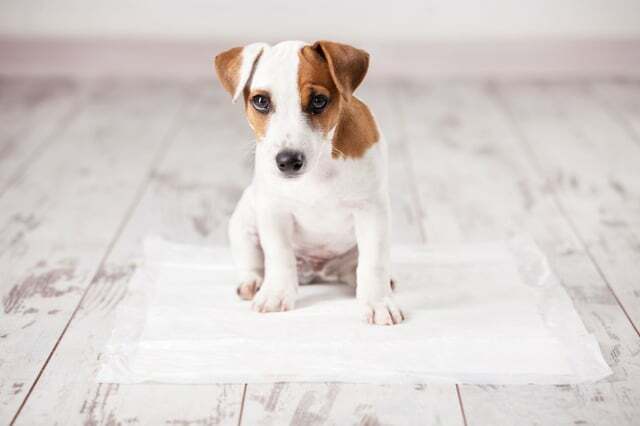 Owning a larger breed or an adult dog usually requires large or extra large pee pads so your pet will have enough room to finish his or her business. 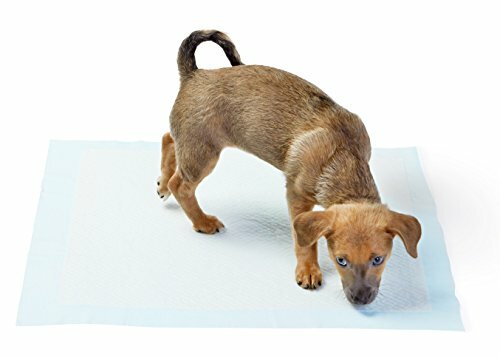 Extra large pee pads are also great when making your dog’s bed or when traveling. Keep in mind that if you want to prevent accidents to senior dogs, the best way would be to place the pee pads inside dog beds for large dogs. Another important aspect about pee pads is their thickness. Obviously, the thicker the pad, the better the absorption you will get. 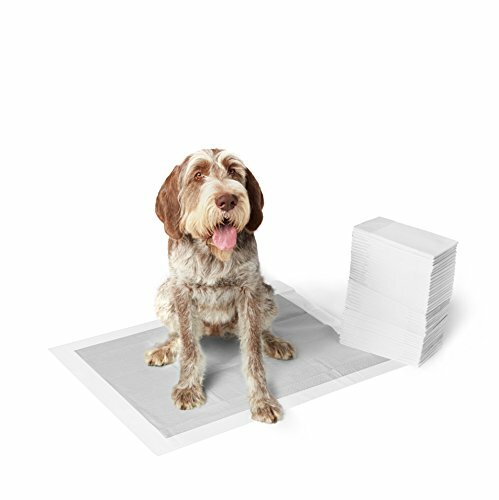 Most cheap dog pee pads come with 4-5 absorbing layers, but you can also find products with six different layers. It is essential to choose thick items as they can retain more liquid and provide improved protection for your house surfaces, including tiles, carpets or wood floors. On the contrary, thin pads are mainly suitable for adult dogs that might suffer from accidents once in a while, especially if they battle urinary tract infections. We also suggest placing these pads directly on their beds or on washable floors like tiles or stone. If you choose poor quality products, you might end up replacing them too often as they won’t be too resistant to tearing. Some materials can easily shred or tear once they are soaked, and they practically become useless. Therefore, we suggest you take a look at the online dog pee pads reviews and choose the one that will be right for your companion. There are countless reviews from verified buyers which can help you identify tear-resistant products at affordable prices. Lastly, a decent product should also be able to neutralize bad smells. Although some odors are natural for dogs, others may be the cause of a poor or an unbalanced diet. So, apart from teaching your dog how to go to the bathroom outdoors, you might want to take a look at its dietary habits. We suggest switching to organic dog food from an early age or, at least, provide some organic and healthy puppy training treats. Some of the ingredients in these products will fight bacteria and will eliminate the specific odors of urine. As we previously mentioned, making your dog happy requires more than spending a few hours a day with your friend. It implies your complete dedication and love, as well as a considerable budget for high-quality senior dog food, beds, chew toys, and grooming products such as a new organic puppy shampoo and conditioner.